A Garden wedding with Brisbane’s Very Good Celebrant, Glenda J Ashleigh, is just delightful! The sun is shining, the birds are singing and everything is as it should be – perfect! All is well in the garden. Parks and gardens in Brisbane, Queensland (fantastic one day, perfect the next!) make great venues for outdoor wedding ceremonies. 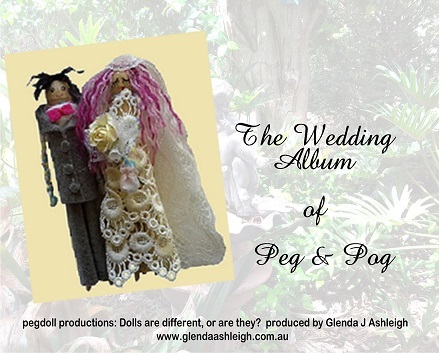 Brisbane’s Very Good Celebrant, Glenda J Ashleigh, conducts the wedding ceremony just the way that Peg and Pog want. Everyone feels relaxed and happy. 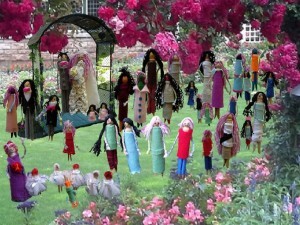 They really enjoy the charming ceremony and the garden setting. The roses are blooming, the grass feel like carpet, and there is plenty of space for all to see. Providing the sun keeps shining, all will be well for the wedding party, service providers, and of course those very important people, the guests. Delightful! But then, who can control the weather? A few clouds drift over, and then some more… Quick! Here comes the rain, run! Where do people run to? What do they do when they get there? What do you do with soggy people? A bedraggled bridal party does not look good, especially in photographs and videos. If you consider holding your wedding ceremony in a garden or one of the many delightful parks in and around Brisbane, be prepared with a ‘rainy day’ option. Is there shelter close to the ceremony area? Is the shelter large enough to provide cover for everyone? You might want to tell guests to bring their ‘brollies or you can provide umbrellas for them. Be prepared. Check out the shelter option in your chosen park. Avoid becoming a ‘soggie’ on your wedding day! Delight your guests, they will thank you for your good planning. Wedding Bells with Celebrant Glenda J Ashleigh! The wedding bells are ringing! I am SO happy to be working with Easy Weddings. please like my Facebook page. click on my Easy Weddings link and contact me. I’d love to hear from you and them! And yes, I made these darling little wedding bells. Just one of the many ideas and unique touches that I bring to the wedding ceremonies I conduct. What do I charge for them you ask? Nothing! 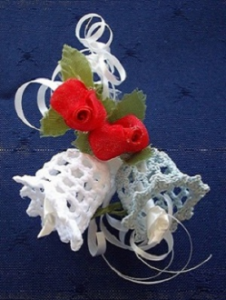 I make these little bells with love, to give them to delighted couples. Some times the little bells decorate the charming wedding ceremony scroll that contains the script of the couple’s wedding ceremony. At other times, the little wedding bells are given to the bride as a favour, a special keepsake for a special day. No two weddings are the same, and no two wedding bells are the same. I hand-make each tiny bell with love. The bells come in a variety of colours. 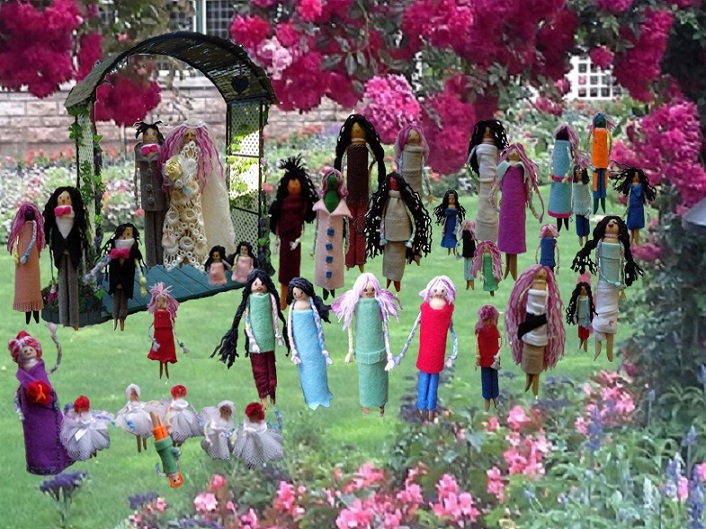 I try to match the wedding bells to the colour range chosen for the bridal party. These little bells are only available when couples engage me as their Celebrant. I do not make them to sell! They take too long to make. These little bells can ring out the joy on your wedding day! Did you know that Easy Weddings is your one-stop-shop for everything weddings? You can save yourself considerable time and effort to find the wedding services you would really like. Lots of variety in all categories. You are sure to find the service providers who suit your style and budget. Our wedding ceremony was simple but still had a special touch to it. Glenda is an amazing Celebrant who went and did over the top to help us make sure everything went smoothly. Glenda, thank you for the magnificent manner in which you conducted our Mother's service. It was only your professionalism that ensured that our Mother's funeral service was as memorable as we had envisaged. Our thanks again for your direction before and on the day of the funeral. On behalf of the family Glenda, thank you for the magnificent manner in which you conducted our Mother's service. It was only your professionalism that ensured that our Mother's funeral service was as memorable as we had envisaged. Our thanks again for your direction before and on the day of the funeral. Glenda was a very important part of our wedding! She was professional, friendly and organised. From the start, Glenda was approachable and helpful. Our day would not have been as memorable or run as smoothly without her. She helped us put together a beautiful, honest and authentic wedding which was perfect for both of us. Glenda was a very important part of our wedding! She was professional, friendly and organised. From the start, Glenda was approachable and helpful. Our day would not have been as memorable or run as smoothly without her. We would like to tell people about Glenda She helped us put together a beautiful, honest and authentic wedding which was perfect for both of us. Wedding Album of Peg & Pog.